So I was invited to the Beer Bloggers Summit in Los Angeles last weekend by Kip from BierKast. At first I thought it was a trick and they would jump the beer soaked blogger from Orange County when I showed up at the Sunset Beer Company in Echo Park. Maybe I watched too many LA gang-related movies as a kid? From the outside it looks like a business park with a small parking lot. But on the inside it’s a craft beer lover’s paradise. Craft Beer EVERYWHERE! Beer fridges line the right hand wall and are well stocked with an amazing variety of craft beers. In the center of the room are tables covered with beer bottles on top, and boxes of beer below. In fact, there are boxes of beer along every wall in the place. There are two rooms at Sunset Beer. The beer shop and the tasting room, where our meeting took place. After I took a quick glance at all the beers in the main room, I walked into the tasting room. 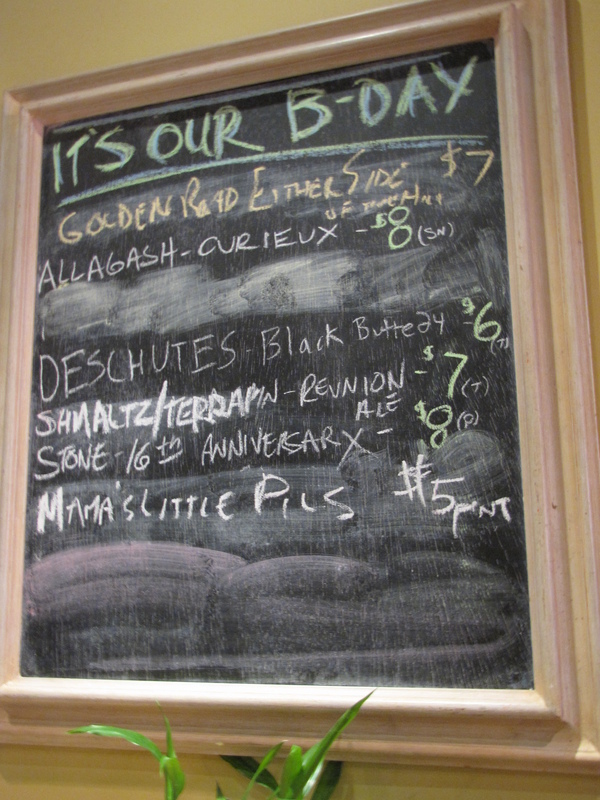 I immediately gravitated to the chalkboard to see what was on tap. It was then that I noticed that it was also the one year anniversary of the Sunset Beer Company. Woo hoo, Congratulations on your first year! Tap List – Happy Birthday Sunset Beer Company! While looking at the menu and agonizing over the decision of what to get, I met Simon from OverCarbed.com He also had a camera slung over his shoulder, so he said, “I guess you’re also here for the summit?” We hit it off and Simon ordered the Allagash Curieux and I got the Deschutes Black Butte XXIV anniversary. I jumped at the chance to taste the Black Butte 24 without cracking open my prized possession. (I have a bottle in the cellar, but haven’t opened it yet.) Boy did I choose wisely, it was fantastic. I don’t think I’ll be aging my bottle, it’s so good right now. Anyway, Simon told me that he brought a couple of bottles of homebrew to share. More on that later. The tasting room was filled with beer bloggers and snacks. There were chips, dips, a cheese plate, etc. Folks were seated around the coffee table filled with goodies chatting so I made my way around the room introducing myself to the other attendees while we waited for the presenter to begin. It was a very informal and relaxed atmosphere. I love the craft beer community, everyone is so friendly. Absolutely zero attitude in the room. Angel City Brewery was the featured guest at the summit. We got a chance to meet and talk with the head brewer, Dieter Foerstner. He gave us an update on the brewery. They are currently undergoing a remodel and are still under construction. They are looking forward to re-opening this Fall/Winter. In the meantime, they are pouring their beers at events and are available on tap at a number pf places in the Downtown LA area. Dieter brought along a couple growlers of his flagship brews; yet to be named West Coast Wit, and West Coast IPA. Both were fantastic. The Wit was a Belgian Style Wit with the hops punched up in the West Coast style, and the IPA was an incredibly balanced brew with a citrus nose and a really clean and smooth finish. Dieter told me he has a background in Lagers so he really strives for balance in his beer. It definitely shows. I could have downed the entire growler myself, it’s totally sessionable. After the presentation, we had a chance to drink some more beer and mingle and exchange business cards with the other attendees. There were quite a few bottles shared, including a barrel-aged brew, Roggenbock from LA Aleworks, a couple bottles of the Sierra Nevada/Russian River collaboration Brux, two different beers from Simon from Overcarbed.com, a bottle of Lambrucha, Hair of the Dog’s Blue Dot DIPA, and probably some others that I’m forgetting. I had a great chat with the Beer Goddess, Erin Peters, about her upcoming trip to Ireland. I had a chance to talk with the BierKast guys, Kip and John, about LA Aleworks. All-in-all I had a great time at the Beer Blogger’s Summit and am looking forward to the next gathering of the LA Craft Beer Bloggers at Beachwood BBQ in Long Beach. Long Beach is much closer to home, so maybe I’ll show up with a couple of beer soaked bloggers next time. Good folks, good beer, and good vibes. Here’s a few miscellaneous photos taken at the event, as well as the menu from Umami-catessen where I had dinner and a glass of the house red ale afterwards. I had a leisurely 2 1/2 hour dinner and then made my way back to Orange County. This entry was posted in Brewery, Craft Brew, Events, Food and tagged Allagash, Angel City, beer, bloggers, Deschuttes, LA Aleworks, Los Angeles, Sunset Beer Company, Umami by Erik. Bookmark the permalink. If you want to hang with a bunch of bloggers for a whole weekend, consider coming to the Beer Bloggers Conference next year. Details for 2013 coming soon but check out http://www.beerbloggersconference.org.